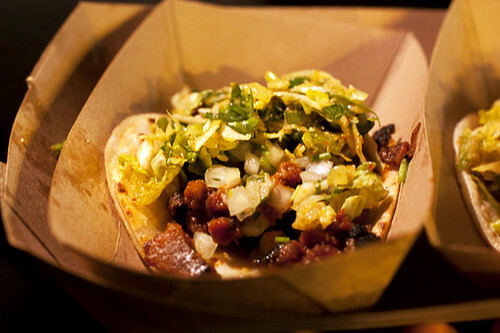 My biggest regret of my Los Angeles trip was not being able to eat tacos from the Kogi Truck more than once. Time was limited, much food had to be eaten, and within no time it was time to go to LAX. Getting sick in LA didn’t help also. I’m not sure what happened, but two days I was wracked with cramps so severe I was convinced it was appendicitis (it was not and still remains a mystery), and two other nights I had such a bad migraine I couldn’t do much but lie in bed gripping my head underneath the covers. I kept telling David my body must be rejecting LA, but he claims it was just jetlag. So because of “my sickness,” a second trip to Kogi Truck just didn’t happen, and for this I am truly sad. Because let me tell you, the first time was absolutely magical. Day 3, or more precisely Night 3 is when we went on the search for the Kogi Truck. There are five trucks now in LA so it’s best to check their online schedule and choose the location of the truck that works best for you. We ended up going to the Eagle Rock location because it seemed like the closest location from where we were (less than a mile), but it ended up taking an hour anyway because of the traffic. OMG, LA traffic! I wouldn’t be surprised if the traffic wasn’t the root to all my health problems in LA. In any case, when we got to the truck, it was a bit confusing because it was parked in front of a dark vacant lot. There wasn’t a line and no people were milling about so we waited in our car across the street for a while because we thought they hadn’t opened yet. After a few minutes, we decided to go anyway, and it turned out the truck was open. There were no people milling about because in LA, people just drive to the truck, order, pick up their orders, and leave. That’s LA for you. I have a theory people are nicer in LA because they aren’t in close contact to people constantly throughout the day. That and the medical marijuana. The Kogi Truck has a three taco combo with a drink for $8, so along with a soda, we got one short rib (pictured immediately above), one spicy pork, and one tofu. Each had a double corn tortilla base (slightly crisp and charred from the grill) and were topped with shredded romaine lettuce and cabbage tossed in a chili-soy vinaigrette, cilantro-green onion relish, crushed roasted sesame seeds, sea salt, and sesame-chili salsa roja. All three were amazing. The short rib, which was basically cubed galbi, was slightly sweet and had a good char, the spicy pork was also slightly sweet with a bit of heat, and the tofu was surprising flavorful. With the addition of the Korean-Mexican dressing and garnishes, everything worked beautifully; spicy, sweet, sour, salty, and savory. Basically, bangin’. After our tacos, we got back on the road and were headed back to our hotel when I mentioned I could have another taco. David must have been thinking the same thing because he immediately made a u-turn and minutes later we were tucking into a kimchi quesadilla ($6), a large flour tortilla filled with shredded cheese (jack and cheddar), sautéed kimchi, and topped with a generous amount of sesame-chili salsa roja. I’ve always thought kimchi and cheese complemented each other, as a child I was a fan of cream cheese and kimchi sandwiches, but this was even better than expected. I can see why the Kogi truck is so popular at night. This is drunk food at its best; immensely tasty and easy to shove into your drunken craw. 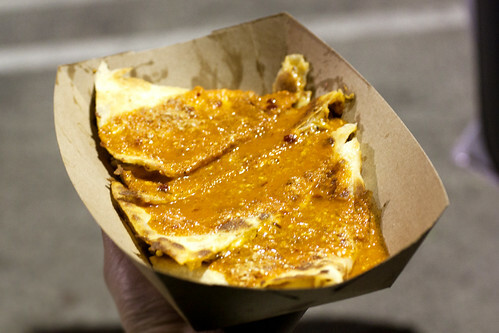 It’s messy because of the hot, melty cheese and drippy salsa, but as long as you grab a few napkins, you’re all good. Or do what I did, get a drink at Taco Bell nearby and use the restroom to wash up after. So this was my biggest regret, but unlike other major regrets in life, this one can be easily rectified. I’ll possibly be in LA this weekend. Kogi Truck, wherever you go, I will find you! That short rib looks great; however, the other taco does not. I am surprised the Taco Bell chihuahua did not bite your ankles! 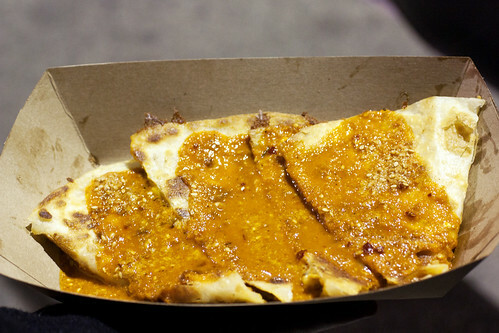 @Someguy – The other one was a quesadilla and it was crazy good. Looks are deceiving! Oh right, they are quesadillas. I will take your word, since you are the food expert!